In the first half of today’s class, we had Wall Street Journal‘s business and technology journalist Lora Kolodny speaking with us on Skype from San Francisco. I know Lora because I subscribe to her Facebook updates and sometime participate in the discussion. Considering that she has written for big names as New York Times, Fast Company, Inc, and TechCrunch, it is a great surprise that she is so approachable! 1) Although social media companies are getting a beating in the stock market, VC interest in social media start-ups remains high. 2) Any new platform, service, etc. must have a clear mobile strategy. 3) Social media adoption in Asia is growing rapidly. 4) For new start-ups, it is essential to evaluate whether they need large investment. Further, creating a personal brand is critical to reach out to potential investors. She suggested joining newer platforms early to create a significant following. Lora has more than 110,000 subscribers on Facebook! 5) She suggested using services like YouNoodle to connect to other entrepreneurs. My students could add more to this. 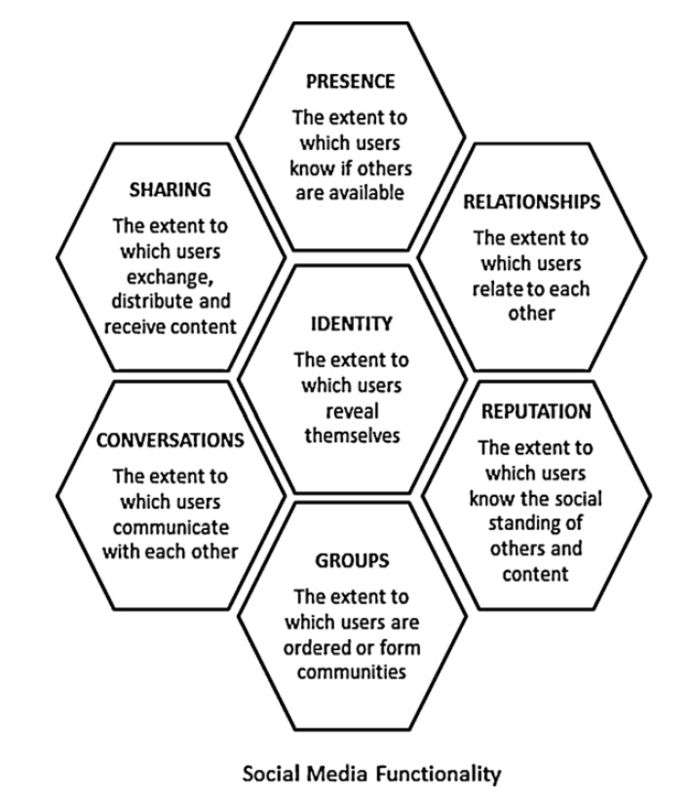 Honeycomb framework identifies seven components of social media – identity, sharing, conversations, presence, relationships, reputation, and groups. The diagram below shows what each component means. The framework give clear guidance to selecting a social media channel. As a business you need to decide what your community is doing and what the community members’ inherent motivations are. Accordingly, one can select the social media channel. For example, LinkedIn has ‘Identity’ as its clear functionality. I know there are a few users on LinkedIn who are anonymous! Yeah, I keep on getting add requests from such people. But what’s the chance that I will ever accept such a request? If one doesn’t reveal one’s identity on LinkedIn, it defeats the whole purpose of that social network! Social networks may have multiple functionalities. Consider Twitter. Originally, Twitter was used for broadcasting the message–sharing on the go. Therefore, ‘Sharing’ was its core functionality. However, these days Twitter also acts as a very common conversational tool. Therefore, ‘Conversations’ is an added core functionality to Twitter. The readers should think about other channels such as Facebook, FourSquare, Pinterest, blogs, etc. to see how they fit into this framework. Once a business identifies the channel, it can use the following diagram to operationalize the channel management. The implications can be different based on the functionality a channel offers. For example, for reputation management, one needs to do a lot of monitoring using tools such as Klout scores. 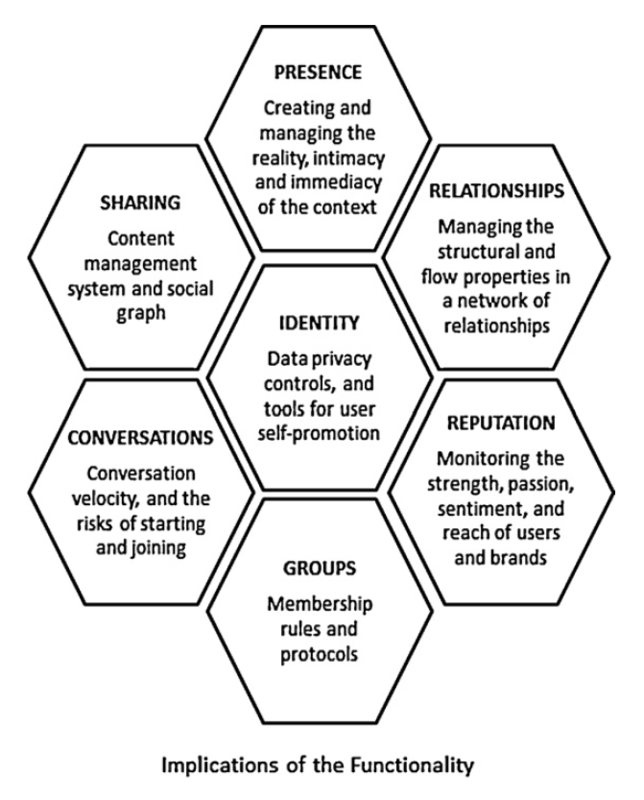 Overall, honeycomb framework is great for channel selection and community management. In the last leg of the session, I tried to answer the question “why do people share?” I used ‘Unselfish Gene‘ article to show one perspective. We know for a long time that the classic game ‘prisoner’s dilemma‘ doesn’t always end up with everyone choosing the game-theoretical solution. In other words people don’t like to betray others easily. Reputational concerns aside, human values are equally important in sharing something for the community’s good. Unselfish Gene tries to bring home that point. In part 1 of the summary, I briefly discussed the case study on SAP. In this part I will focus on 5 Cs of social media – community, conversations, content, channels, and collaboration (co-creation). Before I describe the 5 Cs, I should clarify that these 5 elements of social media are neither original nor all-encompassing. There are, of course, several other aspects of social media strategy that one should take into account. However, as a guideline these five suffice in most cases. There isn’t a clearcut mapping from the traditional 4 Ps of marketing–product, price, promotion, and place (distribution)–to the 5 Cs of social media marketing. Social media marketing gives a lot more importance to the community. It is partly because in many cases a community is already in existence and the businesses want to join it. This differs from the traditional “segmentation analysis.” A community is not a segment with characteristics of its members statistically identified by a marketer. Instead a community is a much more cohesive group of individuals who have some common intrinsic motivation for being a part of the community. Such communities can be described just by this motivation and nothing else. No other identifying characteristic may be attributed to them. For example, the popular financial blog www.zerohedge.com is an example of a completely anonymous community. Most of the blog posts are written under the pseudonym ‘Tyler Durden’–the unforgettable and legendary ‘Fight Club’ community leader played by Brad Pitt in the movie Fight Club. (If you haven’t watched this movie, the only advice I can give you is “Stop reading this blog and watch Fight Club, now!”) I was never an active member of Zero Hedge but I used to read their posts and the comments by members very regularly. During the financial crisis of 2008-2009, we were all driven by the same motivation–to read about and discuss the corruption on Wall Street and the dirty nexus between the banks, government officials, and politicians in the USA. Beyond that there was nothing you could know about us. This underscores the problem faced by a traditional marketer in the digital world. A risky solution is to create your own community. That’s what SAP did. It’s risky because you would never know whether it will capture the attention of your target members, whether they will participate, engage, and contribute, and whether they will spread the word to grow your community. It takes a lot of time and effort (and also a great bit of luck) to organize and manage a successful online community. I referred students to the survey results published by Altimeter. 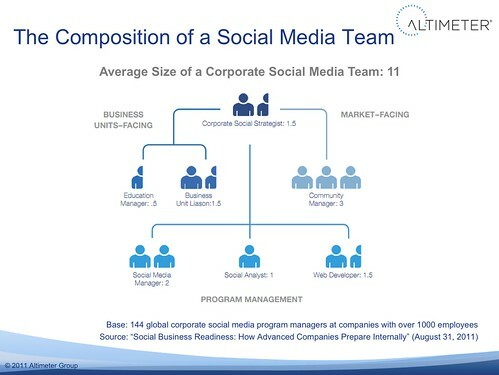 According to Altimeter, the typical size of a corporate social media team is 11 employees. Out of these 3 are the heart of the team–the community managers–who engage with customers. Their primary objectives are to create brand awareness, acquire customers, retain them, create the bran culture, and provide customer service. The social strategist, who is sitting at the top of the hierarchy, makes sure that the performance of the entire team is in line with the objectives set by top management. You can read more about the role of corporate social strategist here. The two guys on the left side of the chart, the education manager and the business unit liaison, hold inward looking positions. They chiefly interact with various business units internally, train people, and make sure that everyone uses a consistent strategy. Social media manager is in-charge of the operations. He/she decides the nature of interaction, gamification, what offers to provide, etc. Web developer is a part-time role and technical in nature. Finally, social analyst tracks various social media metrics. The last part of my course is focused on the metrics and crises management issues. For a small business, 11 social media team members are meaningless. The suggestion from Altimeter is to use the proportions from their compositions. For example, is you want to devote 40 hours for social media in a week, roughly 11 hours (40 x 3/11) should be assigned to community management. Of course, if you hire one person it is impossible for that person to do everything. A person who is good at managing a community not necessarily will be good at doing analytics. A solution is to train your existing workforce to carry out part of these jobs. A person who is good with numbers could be trained to be social media analyst. Further, some of these functions could be automated or outsourced. You may not require an in-house web developer, for example. In the last few months several luxury brands have started using social media more actively. I am getting to see this up and close due to ESSEC’s world-class MBA-Lux program. Our students have to work as strategy consultants for top notch luxury brands for 2-3 months before they graduate. I was supervising two such projects, which involved digital and social media strategies for two luxury brands. (I am not disclosing the names. 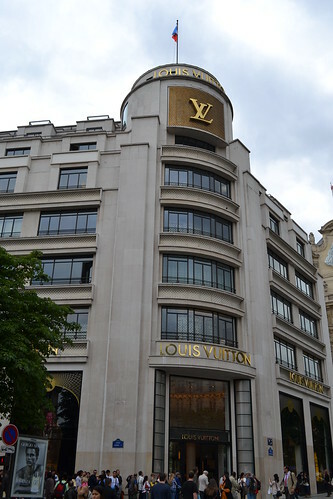 The image of LVMH has nothing to do with these projects either.) In this post I am documenting a few observations from my experience in working on these projects. Luxury brands have been ambivalent about joining social media. On one hand, social media gives them great visibility, opportunity to engage with their customers, and share the brand’s values with them. On the other hand, it exposes luxury brand to mass market, thereby overriding the exclusivity which defines luxury. In addition luxury brands are understandably more sensitive to reputational risks. As I have written earlier, social media also amplify the risk of brand dilution, something that no brand would like least of all luxury brands. It is therefore interesting to know how luxury brands have overcome this fear of social media. 1) In luxury business, social media are more about enhancing the experience of the consumers. This is a tough ask for current platforms. How can anyone create a seamless luxury experience on Facebook, Twitter, etc.? These platforms are for mass consumption. At the same time, many luxury buyers are already using these tools. One potential solution to overcome this problem is to create the luxury brand’s own social network, membership of which will be by invitation only. And while you are at it, why not create it for mobile usage? An app that is exclusively available to only a select few in itself is a great idea! This app will then link to common social networks. Imagine a luxury buyer sharing a picture of an LVMH purse visible only from this app to her friends on Facebook to get their feedback. 2) Try gamification because who doesn’t love rewards? It is an excellent way to keep customers engaged with your brand. Even luxury customers like to score some points, free gifts, or special treatment. Again a luxury retailer can introduce gamification in its own mobile app by tying up with FourSqaure. For example, a “Luxury Mayor” will get a special treatment every time he or she visits the outlet. The special treatment can be tailored to the previous purchases by the customer, thereby making it more relevant.